Patrikio's (formerly Patricio's) Mexican Restaurant in Kansas City has been around since the 70's as one of the most original and delicious mexican restaurants around. All items are made fresh to order according to their original recipes that were created from scratch. Their unique cheese blend gives every menu item a distinctly Patrikio's signature flavor. Another great thing about Patrikio's is the gravy. That's right, I said GRAVY. Burritos, enchiladas, tamales and many more menu items are fresh-oven baked in Patrikio's own special gravy. Once you've had the pork burrito with extra gravy at Patrikio's, you will never settle for anything less. We recommend ordering the "6a" - a small pork burrito with a beef taco. Fill up on chips and Patrikio's unique "peppery" salsa and you won't have to eat again for 2 weeks. This stuff is pretty good reheated for a midnight snack as well. Yummmm! Ponak's is a great little Mexican Restaurant in Kansas City. 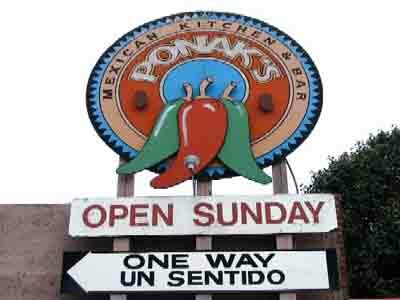 Located "south of the border" on Southwest Boulevard, Ponak's Mexican Restaurant sits neatly in the middle of the Mexican barrio and is full of authentic patrons and cuisine. Some people go for the food and some people go to belly up to the bar and enjoy the atmosphere. Friendly staff and a stellar Mexican menu makes Ponak's in Kansas City one of our favorites. If you are a mexican food lover then you must fit this place in and if vacationing in K. C. do it early 'cause you'll want to go back a second time. Yes it's true and not overstated...THE BEST margaritas anywhere. If you have more than one, then don't even think about driving. Service is friendly and good and the place is not fancy but clean and by the way, the prices are quite reasonable. The restaurant is clean and service is top quality and fast. Prices are extremely reasonable and the portion sizes are quite large. The guacamole dip, rice and beans and the shredded pork burritos are fabulous! You wont leave hungry or unsatisfied! I do not think the service was as quick as a lot of the other Mexican restaraunts around the area. There are SO many places with MUCH better food and MUCH quicker service. I thought the waitresses were rude, and the food was blah. There wasn't much of a selection, and It felt like I was sitting on top of the other people around me. The one good thing about this place was the guacamole dip.. Probably the best ive ever had.. as for the rest of the food, way overrated.. Just okay. Ponak's should be the #1 rated!!! The guacamole is "Like Butter" No Mexican Restaurant in Kansas City has Margaritas as good as Ponak's All of the pork dishes are toally awesome. I have been eating there for over 20 years and it is the best Mexican Restaurant in Kansas City for my dollar. We have been going to Ponak's since the late 70's when Claire was running the place and it consisted of one room with a shuffle board table taking up precious room there. It has consistently been great food at good value. It does get crowded especially on Friday nights, but this is expcected with quality Magarita's and great food. The quality of meat they use in their pork burritos and Sonoran tacos is unsurpassed. My hat is off to the great cooks there. Without a doubt, Ponak's continues to take the award for best Mexican food, the absolutely best margaritas (not a sissy drink - be careful), friendly wait staff, FAST, FAST, FAST service with little wait time for your food, and a place where friends and family from out of town request one meal during every trip back to KC. That has to be the best menu I've ever seen by a restaurant. The choices are endless. It may take a little studying before you can order but the food will have you coming back often enough to get plenty of practice. I especially appreciate the affordable A La Carta choices i.e. 3 soft chicken tacos, 3 chicken enchiladas (about $5 each, goodsize). We've been going to Sol Azteca, and their sister restaurants in Johnson County - Dos Reales, for over 5 years and have yet to have a bad meal! We have birthdays, anniversary parties, engagement parties there, besides going on our own at least once a month. Service, authentic food, ambiance (esp. Dos Reales) and very inexpensive prices keep us coming back for more! I Love Mexican food. For years I had been searcing for a Mexican restaurant that I could really fall in love with. I found many good ones, but it wasn't until I walked into Sol Azteca that I found my south-of-the-boarder-heaven. For both value and quality, I have yet to find anything approaching it. Over the past 4 years, I have tried almost everything on their extensive menu, and I haven't found anything that was less than very good. A good place to start would be their three "Super Special Dinners, " which give you huge portions and variety at an incredible $7.50. The number 1, my favorite of the three, gives you a tamale, a taco, a chalupa, a chilli relleno, an enchilada, rice and beans!--easily enough food for two. Picking blindly from the menu will, however, garner nothing but winners. Special mention, though, should be made of the enchilada nortenias, chilli Colorado, Burrito Rojo, fajita cassadias and their chicken choices. (When there is a choice pick chicken over beef. Their beef is excellant--and they offer ground or shredded--but their chicken is extraordinary.) The service is extremely fast and efficient--so much so, that you should not order immediately. Instead relax with a drink and their warm and wonderfull corn chips and salsa which comes to your table before you have a chance to sit down. If you are really big into ambience, than you might knock down their rating one-half point. Even so, for my money, it's one of the best dining experiences in the KC area. Chicken, ground beef or pork. Especially for our friends from the North. Flour tortilla, cilantro-lime rice, choice of pinto or vegetarian black beans, meat, salsa, cheese or sour cream, and romaine lettuce. The vegetarian burrito includes guacamole. Just like a burrito but with sautéed peppers and onions instead of beans. The vegetarian fajita has both sautéed veggies and vegetarian black beans instead of meat, and includes guacamole. Burrito or fajita in a bowl, no tortilla. 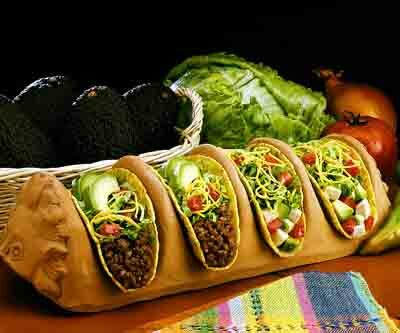 Soft flour or crispy corn tortillas, choice of meat, salsa, cheese or sour cream, and romaine lettuce. Romaine lettuce with choice of beans, meat, salsa & cheese, with freshly made chipotle-honey vinaigrette. Marinated for hours in our chipotle adobo, then grilled. pepper - seared, then braised for hours. Shredded beef, braised with our own chipotle adobo, cumin, cloves, garlic and oregano. Includes our fresh-made guacamole and vegetarian black beans. Add sautéed peppers and onions for a vegetarian fajita. Chipotle's naturally raised meats are free of antibiotics and added growth hormones, fed a vegetarian diet and humanely raised. "Food With Integrity" isn't a marketing slogan. It's not a product line of natural and organic foods. And it's not a corporate initiative that will ever be finished or set aside to make room for other priorities. It's a philosophy that we can always do better in terms of the food we buy. And when we say better, we mean better in every sense of the word- better tasting, coming from better sources, better for the environment, better for the animals, and better for the farmers who raise the animals and grow the produce. The hallmarks of Food With Integrity include things like unprocessed, seasonal, family-farmed, sustainable, nutritious, naturally raised, added hormone free, organic, and artisanal. And, since embracing this philosophy, it's had tremendous impact on how we run our restaurants and our business. It's led us to serve more naturally raised meat than any other restaurant in the country, to push for more sustainable practices in produce farming, and to work with dairy suppliers to eliminate the use of added hormones from their operations. It's even influenced the way we view other aspects of our business, from the materials and systems we use to design and build our restaurants, to our staffing and training programs. We like the food we serve today. And, because of our Food With Integrity philosophy, we're confident that we'll like it even more down the road. Why romaine lettuce when iceberg will do? Why trod the muddy fields of Iowa to see how pigs are raised? Why toast the cumin before you grind it? Why cumin, indeed? The reasons are as simple as better-tasting burritos, and no less ambitious than revolutionizing the way America grows, gathers, serves and eats its food. Doing all these things better, from start to finish, is our mission. We call it Food With Integrity. It energizes everything we do in our restaurants and behind the scenes. It cannot be captured in a food bite, or a sound byte. So read on. Let's begin by dismissing the myth that freshness alone means superior food quality. Is it important? Of course. But freshness, at Chipotle, is simply a given. In the unending pursuit of quality food, using fresh ingredients is where you start, not where you finish. At Chipotle we have a very focused menu. Our customers like that, and it gives us the opportunity to concentrate on every single ingredient that makes up our recipes. Food With Integrity means working back along the food chain. It means going beyond distributors to discover how the vegetables are grown, how the pigs, cows and chickens are raised, where the best spices come from. We learn how these factors affect the flavor of the finished product. And what we can do to improve it. Take our carnitas, for example. In pursuing new sources of pork, we discovered naturally raised pigs from a select group of farmers. These animals are not confined in stressful factories. They live outdoors or in deeply bedded pens, so they are free to run, roam, root and socialize. They are not given antibiotics. Consequently the pork they produce has a natural, moist, delicious flavor. We think it tastes better and is better for you. Our customers love it. And because they do, we buy all we can. By creating a market for meats raised in a healthier environment, we make it worthwhile for these farmers to raise even more. That's how Food With Integrity works for everyone. Today we're doing the same with new sources of chicken, beef, beans, avocados and even lettuce. We'll be doing it with every item that goes into our menu. Food With Integrity is not a fad. It has been part of Chipotle since we started in 1993. Its importance has grown as we have grown. And make no mistake, growth can be good. Our size helps us influence the decisions of our suppliers. And it lets us shoulder our way into the consciousness of the American eating public. Like we're doing now. Our size means we can change for the better the way more people eat. What does all this mean for you? In the short term it means better-tasting tacos and burritos. If you have been with us for several years you will have already noticed a difference. Looking forward, it means encouraging growers to pursue humane and healthy practices, and rewarding farmers who eschew mass production in favor of quality. It means new and higher expectations from all of us about what we consume every day. Have we achieved our mission? No. Will we ever accomplish it? Never, because Food With Integrity is a constant process of searching and improving. But the changes will be noticeable, positive and significant. And you're part of making it happen, every time you come in. -Some people misspell our name " chipolte "
·Our foods at Chipotle have no artificial colors or artificial flavorings. ·Our foods contain zero trans fats. Although by law we can say that our large burrito tortillas and our small soft taco tortillas contain zero trans fatty acids, they actually contain a negligible amount. Since a serving of our large burrito tortillas and our small soft taco tortillas contains less than 0.5 gram of TFAs, we are required by the FDA to declare the content of these tortillas as "zero” grams. The rest of our foods do not contain any trans fats at all. · We use no sugar (although there is honey in the vinaigrette) in our foods. · We use no peanuts, tree nuts or any other kind of nuts in our foods. Only our cheese and sour cream contain any dairy. And there are no eggs in our foods. · Chipotle is the largest restaurant buyer of avocados and naturally raised meats in the country. · We offer a number of vegetarian and vegan dining choices. · There’s a picture of Evans, our first restaurant, in every Chipotle. · The Evans restaurant was originally a Dolly Madison ice cream parlor. · Chipotle’s first restaurant manager, Joe Stupp, still works for us as Manager of Duct Tape and Plungers (the website guy). · We’ve only had one change in our menu in 13 years—the addition of salads (and chipotle-honey vinaigrette) in 2005. 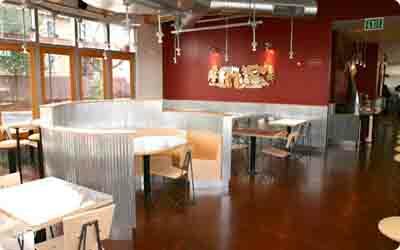 · Steve Ells modeled Chipotle after the taquerias in the Mission District of San Francisco. When I opened the doors to the first Chipotle near the University of Denver in 1993, I didn't have a grandiose political statement in mind. Just the opposite, really. What I wanted to do was simple: apply the techniques I had learned at the Culinary Institute of America and in professional kitchens into making great tasting burritos and tacos with the best ingredients I could find. Price them reasonably and serve them up in a hip, friendly, casual environment. The concept seemed to me straight forward and altogether needed. Done well, it would let me show that food that was made fast didn't have to be like typical fast-food. Of course it never occurred to me that someday we'd have hundreds of restaurants, and that each would strive to offer people something a little better. One of the reasons I've always loved cooking is that it challenges me as much as it pleases me. I'm always looking for ways to improve upon what I've done. For years, it bothered me that our carnitas didn't taste how I wanted them to. They weren't bad, but I knew they could be better. I tinkered with the recipe, but it still wasn't what I wanted. One day I was reading acclaimed food writer Ed Behr's newsletter, The Art of Eating. In it he wrote about Niman Ranch and Paul Willis, a farmer in Thornton, Iowa who ran his hog farming program and raised pigs the old-fashioned way. The way it was done for many years before factory farms grew prominent in the 1960s and 70s. The pigs Behr wrote about got to frolic in open pasture or root in deeply bedded barns. They weren't given antibiotics. The farmers who raised them truly cared about the welfare - and well-being - of the animals in their care. In short, these farmers relied on care rather than chemicals, and practiced animal husbandry the way their parents and grandparents had, and their parents and grandparents before that. Sometimes, moving forward means taking a few steps back. After I read Behr's article, I knew that the trouble with our carnitas wasn't the recipe. It was the commodity pork we had been using. The majority of pigs in this country are raised in extremely inhumane conditions. Often, thousands of pigs are crowded into a single confined facility, known as a CAFO or Confined Animal Feeding Operation. Many of them spend their days in crates that don't allow them enough room to turn around. Some are housed together in group pens, but in quarters that are still so cramped they can't exhibit their normal tendencies. Animals are more prone to disease in confinement, so they are typically given antibiotics for most of their lives. Learning about this dark side of modern agriculture made me want to find out how we could do things differently. So I got on a plane to Iowa to visit the Niman Ranch hog farms, including Paul Willis's. And that was where my own revelation took place. It was clear to me visiting Paul's farm that his way of raising pigs was a better way to do it. That's what I wanted for Chipotle. In 2001, we began buying our pork from family farms like Paul's that raise pigs humanely and without antibiotics. We call this return to old school animal husbandry naturally raised, and it's an essential part of our larger Food With Integrity mission to source the highest quality ingredients from the best sources. And, in the process, to help create a more sustainable food chain that emphasizes the welfare of people, animals, and the land. Today, in addition to all of our pork, nearly 60 percent of our chicken and more than 40 percent of our beef is raised in this way. And someday soon, all of the meats we serve will be naturally raised. It was very gratifying for me to read a recent interview with Ed Behr in which he said that the best thing to come from anything he had ever written had been the article on Niman Ranch and Paul Willis for how it influenced Chipotle to buy naturally raised pork. Indeed, Behr's article inspired us to use our size to fashion a more sustainable agriculture through Food With Integrity. And it led directly to Chipotle buying more naturally raised meat than any other restaurant in the country. I never aimed to be an activist for family farms or sustainable agriculture, but I'm proud of the change we've helped to achieve. The vision I started out with at our first Chipotle has never dimmed. In fact, it has grown from meeting people like Paul Willis, whose own vision exemplifies the kind of change Food With Integrity is all about. Food With Integrity is our mission, but we know that at the end of the day, we can't judge our own integrity. That's for our customers to decide. So all I can say is that we are still leading from what we believe is right, and constantly striving to improve the way we do things. 620 W. 48th St., Kansas City, Mo. Cosmopolitan Mexican food made from classic recipes and modern favorites using only the highest quality ingredients. Start with tortilla soup or queso “chorizo.” Try the rib-eyes fajitas or chicken con hongos. 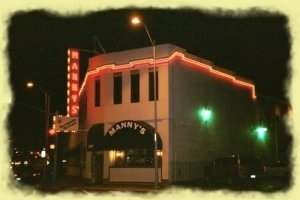 Enjoy their famous margaritas or ask for the special Mambo Taxi. Price range: $7-$11. Hours: 11am-10pm, Mon.-Sun., later on weekends. On a Monday, as the weekly grind gets its start chewing up your time and energy, nothing beats a lunch on the Country Club Plaza. This is especially true when your window-side table lets you take in the sun-splashed streetscape of pedestrians and Mediterranean architecture. 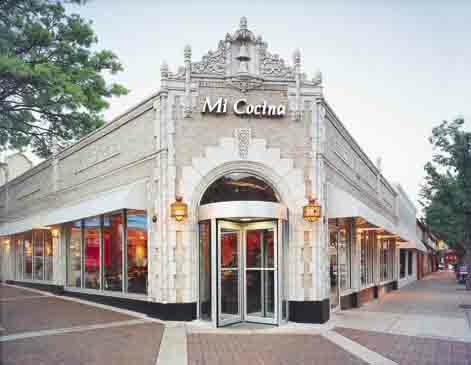 A Monday lunch at Mi Cocina is akin to taking your siesta a few hours early instead of midafternoon. The corner location boosts the natural light (and window booths) that filters in to compete with the soft, summer-sky blue ceiling lights and gold and bronze hues on the walls. Four gold-colored columns surround a room centerpiece of sorts made of plants and encircled by tables. My lunch companion and I were seated in our window booth immediately. Our drinks arrived within two minutes. In fact, three people stopped by to make sure our drink orders had been taken. The menu describes fairly standard Tex-Mex fare, shuffling the base foods into various combination plates. I guess there's really only so much you can do with burritos, enchiladas, tacos and huevos rancheros dishes. We requested a half-order of an appetizer called Locos al Carbon. Fourteen minutes later, the server appeared with a tray of six oversized tortilla chips with a bean paste topped with grilled chicken and melted cheese. The silver, gold-handled tray contained dollops of guacamole and pico sauce. If I could have, I would have canceled by lunch order and simply eaten more of the appetizers. The half-order is $7.50; the full goes for $10.50. Other appetizers included quesadillas, flautitas and salads ($3.95 to $11.95). My lunch date ordered chicken tacos a la carte with Latin stir fry on the side. The tacos were $8.95, and the stir fry was $3.50 extra. He put the stir fry atop his tacos. I ordered two beef burritos (No. 7), which come with rice, beans and a side sauce (I chose cheese). The burritos looked a little skinny, but they proved to be more than enough to make me feel full. The menu's volume of choices made a selection difficult. Several things caught my eye. One under the "Tex-Mex Basics" category was the Deluxe 57 ($11.95), which includes (take a breath) cheese enchilada, chicken enchilada, beef enchilada, beef taco, cheese taco, pork picoso, tamale, and rice and beans. If I were a whole lot hungrier or wanted to share, this mongo sampler plate would have been ideal. Another interesting-looking item was under "Huevos Rancheros." It was called "A La 'M'" ($6.95) and included bacon, tomato and jalapeno, sautéed with eggs with beans and potatoes. We passed on dessert, so we could walk rather than roll out. The service was fast (11 minutes from order to entree arrival), friendly and unobtrusive. Our table was more than big enough to hold all our gear. The portions were more than enough. The buzz made sure you knew you were out somewhere hopping (the place was almost full) but didn't prevent easy conversation, even with a soft talker like my lunch date. The damage: $31.25 before the tip. It's a small price to pay for a nice, early-week break. And it's enticing enough that maybe I should consider midweek, late-midweek and end-of-the-week siestas, too. "A Little Mexico on The Paseo"
Mama Tio's Mexican Restaurant in Kansas City - "A Little Mexico on The Paseo"
My friends and I have loved this place for so long that I can remember having to be dropped off there by our parents. Mama Tio's is definitely an enigma of mexican restaurants in that their recipes are so basic that you wonder how it could taste so great! Very laid back atmosphere with an on-the-job owner who will gladly shoot the bull with you. Great service and great prices. Mama Tio's is one of the only Mexican restaurants left that has a "help yourself" chip and salsa bar. You gotta love that. 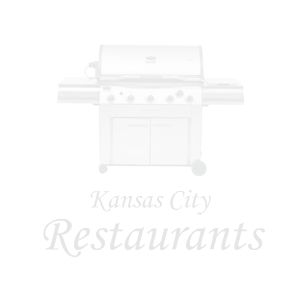 Mama Tios is a family-owned-and-operated Mexican restaurant in Kansas City, Missouri, that offers a wide array of delicious dishes to choose from. Our large-portioned dishes feature burritos, enchiladas, tacos, and a whole slew of amazing entrees that will blow you away. A meal can't be a meal without an accompanying drink. That's why our full bar offers foreign and domestic beer, the ever-popular margaritas, liquors such as Jack Daniels™, Jim Beam™, and various tequilas that provide that extra zing! When you set foot in our Mexican restaurant, you'll be able to sink your teeth into the Sancho Supreme or, if you're brave enough, the 3-POUND BURRITO! That's right; 3 pounds. If that isn't enough, we also provide catering and delivery to local hospitals. What more could you want? Come by today and see all that our menu offers.